Steve Fitch is among America’s most well-known chroniclers of the American West since the days of Easy Rider. 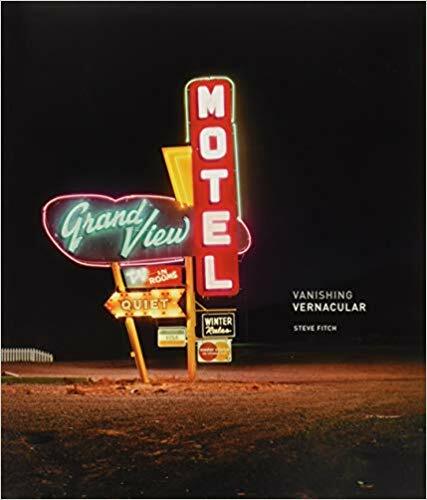 He has been photographing examples of the West’s changing vernacular landscape and vanishing roadside landmarks for more than 40 years. In his new book, he presents both the ancient and the modern by way of petroglyphs, neon motel signs and hand-painted business signs, drive-in movie theater screens, and radio and cell towers. All of them are now endangered because of the advent of the Interstate Highway System and corporate franchises. In this fascinating and comprehensive account, we are able to join in Fitch’s expansive journey, truly an odyssey, as represented in the book’s 120 unforgettable photographs, all sequenced to mimic the open road—both during day and night. Fitch explains the project in his informative introduction, in which, interestingly, he suggests that the petroglyphs of the ancient Pueblo people have endured far better and longer than anything made during the last sixty years. Curator Toby Jurovics, in his insightful concluding essay, positions Fitch’s work in relation to that of the practitioners of the photographic style known as the “New Topographics” and Fitch’s own view of photography as a visual form of cultural anthropology.